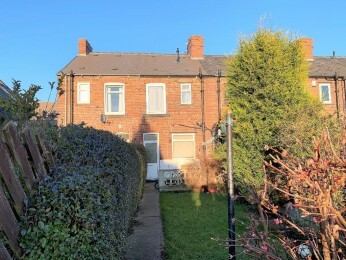 **NO CHAIN AND CLOSE TO M1 MOTORWAY NETWORK** This two bedroom mid terraced house has accommodation comprising, hallway, lounge, dining kitchen, two bedrooms and bathroom. The property enjoys gas central heating, double glazing and gardens. Located in the popular village of Birdwell which has easy access to the M1 motorway network. Double glazed front entrance door leads into the lounge, featuring a double glazed window, central heating radiator and feature gas fire situated in a modern white surround with tiled inset and hearth. The room is tastefully appointed. Featuring a central heating radiator, stairs rising to the first floor and door leading through to the kitchen/diner. Modern fitted kitchen with a wide range of matching wall and base units with an expanse of roll edge worktop space over incorporating a one and a half bowl sink unit with swan neck tap over. There is a double glazed window overlooking the rear and double glazed door giving access to the rear. There is complimentary tiling to the walls and tiling to the floor. Plumbing and space is provided for an automatic washing machine and space for a free standing cooker. A further door gives access to the stairs leading down to the cellar. Providing access to the bedrooms, family bathroom and featuring a double glazed window overlooking the side elevation. Access to the loft is also provided via drop down ladder. Spacious Master Bedroom featuring a double glazed window and central heating radiator. The room is well presented. Second bedroom again well appointed and featuring a new fitted carpet. There is also a double glazed window overlooking the rear and a central heating radiator. The bedroom also boasts a useful storage cupboard. Fitted with a matching three piece suite incorporating a low flush WC, pedestal wash hand basin and bath with electric Mira shower over. There is complimentary full tiling to the walls, central heating radiator and double glazed window with obscure glass. The bathroom also features a cupboard which houses the combi boiler. A small garden area is found to the front of the property and to the rear is a garden area that is enclosed and not overlooked.